In conjunction with the Arizona Mining Association, DP Industrial contributed to the project of providing local school districts in cities close to mining operations with a Mobilize Public Access Medical/Trauma station. This piece of equipment allows a teacher or coach to quickly administer lifesaving rescue efforts to students or administrative personnel at the school before First Responders can arrive. Each kit includes items necessary to treat Severe Bleeding, Unconsciousness, CPR, Reuse Breathing for Children and infants, AED Application, Hypothermia, Seizures and Choking. 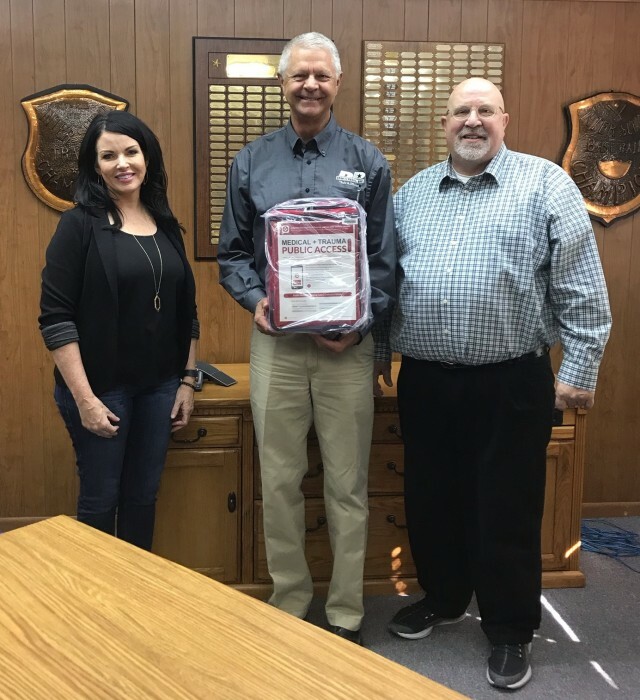 Robert Breitling from DP Industrial presented the Globe Unified School District with a kit on April 9, 2019. In attendance at the presentation was Jerry Jennex Superintendent of the School District, and Robin Bradford from Freeport McMoran Miami operations. On Friday August 3rd 2018 DP Industrial participated in the 23rd Annual Walt Lawrence Golf Tournament in Elko Nevada. Walt was a metallurgical engineer and graduated from Montana Tech (https://www.mtech.edu/). Walt was a key member in his career with Newmont in helping in the design and construction of Mill 2, Mill 5, and Mill 6 at Newmont’s Gold Quarry location. He worked for Newmont for 18 years until he passed away in 1994. An endowment fund was set up at Montana Tech to award scholarships to students studying to be metallurgical engineers. All money earned form this golf tournament goes to this endowment fund. With the help of Newmont, DP Industrial, and other business we raised $17,000. Felipe was nominated as February's employee of the month for traveling to North Dakota in the worst snow storm of the year, as well as his client relations. Felipe defines himself as "friendly, efficient, and secure." Felipe has interest in business management, he hopes to one day work his way up to project manager. He has enjoyed working with DP because of the flexibility, more time with his family, and lower stress levels. Felipe work’s safe for himself, and others around him.